The Konica Bizhub Press C6000 Pro is a 60 page per minute black and white and 60 page per minute production color copier, printer, and scanner from Konica Minolta. This Konica Minolta bizhub PRESS C6000 Pro includes PF602 LCT, IC306 External fiery print controller, relay unit and staple finisher. 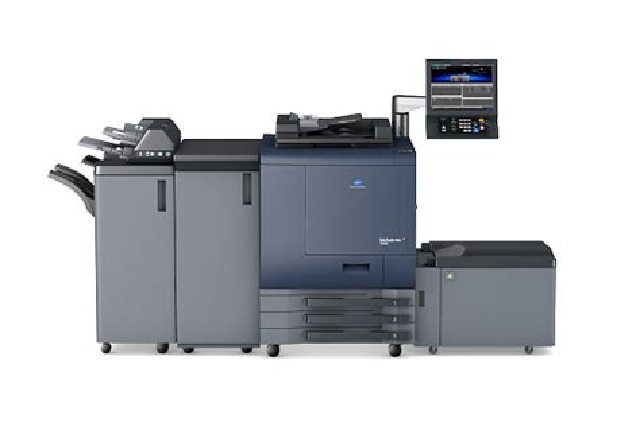 Recommended monthly usage on this Konica Bizhub Press C6000 is 280,000 copies. The Konica Bizhub Press C6000 and all of our other used copiers and wide format printers are tested and inspected by our in house technicians. *1 Printing speed may vary according to the paper weight. *3 Excluding control panel and output tray. Including back side duct. * Konica Bizhub Press C6000 / C7000 Hard Disk Kit HD-504 and Preview Kit PH-102 are necessary. Approx. 300 sheets max. (less than 30mm thick)/approx. 10 sheets min. We purchase Konica Bizhub Press C6000, C7000’s along with Canon Copiers, Konica Copiers, Ricoh Copiers, Toshiba Copiers, Kyocera Copiers, Sharp Copiers, Xerox Copiers, and many other brands! Call us at your earliest convenience and we will be happy to help you with all your used copier and printer needs, 570.602.1640.